Last year in February half term it rained loads, was absolutely freezing and all the kids were sick. So we decided this year we were going to go away so we could get some sun as it’s the hardest week to entertain kids at home. We looked at Thailand as it’s lots cheaper than the Caribbean but it’s too far to go for just a week. Dubai we could only have afforded 4/5 days and for the expensive they can get some bad weather in February so we didn’t want to chance it. Everyone says the Canaries are all year round warm so we settled on there. When we have been before the weather can be overcast and windy so we came to the conclusion that a cruise would be a good idea so that if the weather was poor we would still have lots of entertainment plus we could pick up better weather as we moved to the next island. We had fantastic weather which was actually really lucky as the weeks before they had rain non-stop. 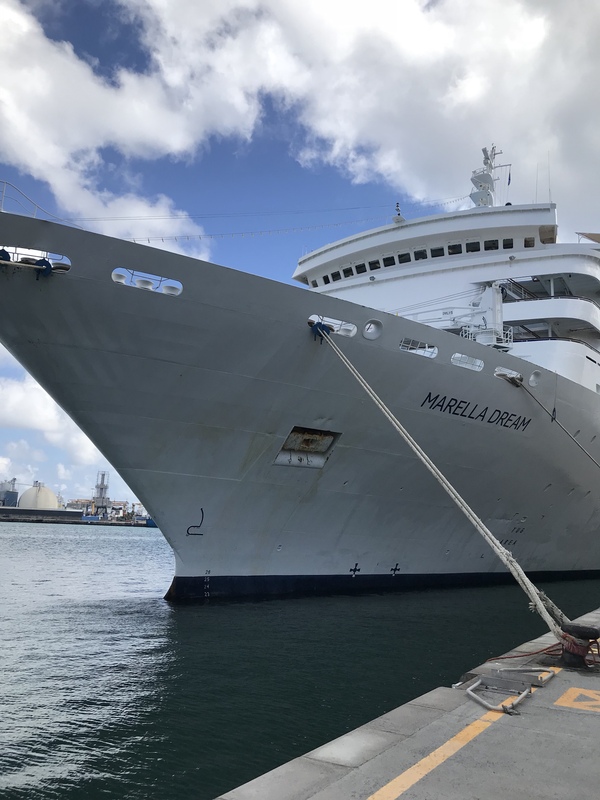 Marella is the cruise part of Tui. The Dream is their most basic ship but we really enjoyed it. You get what you pay for and for 5 us to cruise all-inclusive for a week under £4000 is considered cheap. We booked in July and because we booked so early we got the all-inclusive drinks package included too. This is usually £199 per person. All tips are included in the cruise so we knew we were going to be spending no money at all. The boat is old fashioned compared to ones I’ve seen on tv but it’s still clean and in good condition. We had an outside plus cabin for 4 and an inside cabin for 2 on deck 5. I had read the lower down you are the more stable you are and the more in the middle of the ship the more stable so that’s why I paid a bit more for an outside plus. We weren’t in rooms next to each other but we were just along the corridor and it saved me £90 on booking ones next to each other. The rooms were really spacious…much better than I was expecting. And we even had a bath! I did enjoy having a porthole so we could see where we were each morning as we arrived. There was so much food it was ridiculous included in the all inclusive yet there were other restaurants as well you could pay extra for. As I have mentioned before, I dislike all-inclusive usually as I hate having to queue and keep going back up with each child. There was one restaurant that was included but it was table service. We loved this and mostly ate here. Some people complained they didn’t like it because the meals were small…they were smaller than you would probably service yourself but you were still eating 3 courses so I wasn’t going to starve. There was afternoon tea, pizza and burgers all day plus our favourite…the midnight buffet. This was definitely my weakness. After drinking prosecco for hours on end a late night curry and burger snack was awesome. They still had cakes out so the kids loved acing a midnight feast. The kids club was on for 1.5 hours in the evening so we would take them to eat first and then we got to go for dinner just the 2 of us some nights. The sessions were 9-11, 3-4.30 and 7-8.30 and we’re for kids 3-7. They had other sessions for 8-11 year olds. There was entertainment all day long, 2 shows in the evening in the main theatre and discos into the early morning. We found the shows to be fantastic especially Africa which was pretty much the Lion King. The seats fitted 2 people and were really comfy plus they served drinks and cocktails to your seats. The Captain’s dinner was on our first proper night and it was a lovely experience. You get to meet the Captain and have photos then there is music in the theatre followed by dinner in the main restaurant. The majority of the boat wore tux and cocktail dresses so it felt really special. On the first day we went to La Gomera which is a very small island. There isn’t much to do here and the beach was black rock so we just had a wander around the town. It was nice to see a more traditional island and it was carnival time for the kids enjoyed watching that. We only had until 2pm here as we were travelling a long way up to Madeira but you didn’t need long. We didn’t pay for any excursions as we didn’t want the expense and wanted to keep flexibility. The second day was Madeira which has never been on my radar to visit but it was beautiful. I’d say it was my favourite day of the cruise and I think the kids would agree. We did our own excursion here as I had read it was cheaper to do it yourself than with the company. We went up to the top of Funchal in a cable car that cost £22 for us all as under 7’s are free. We only went one way as we got a “toboggan” back down. Now they call it a toboggan but it’s really a wicker chair! There are 2 men steering it and it’s on main roads so they have to watch out for cars. Apparently it used to go on even busier roads but they have started to tame it. It was so much fun! The boys haven’t stopped talking about it. The toboggan only takes you half way down so they say it’s a 6km and you need a taxi back as it is so steep but we walked and saved ourselves €25! The toboggan had already cost €60 so I wasn’t paying anymore. It was steep and it did take a while but it was all downhill. The next day was a sea day. It was sunny but really chilly which meant we needed to wrap up on the top deck. The ship had 2 pools but they were freezing! They are filled from sea water each morning so the kids went in once and jumped straight back out again. The kids club put more entertainment on that day so no one was bored. On the 4th day we went to Lanzarote. We have been here a few times before so knew where to get a taxi to. There was a coach transfer with the cruise for £24 for the 5 of us but we found the taxi option cheaper and easier. It was a lovely hot day so we spent it on the beach playing football and building sandcastles. That day was Valentine’s Day so we went for dinner just the two of us, drank lots of all-inclusive prosecco and they gave all the ladies on the ship a rose. Most romantic Valentine’s Day I think we’ve had post-kids! The 5th day was Fuerteventura and I didn’t have high hopes for here as it was always cloudy when we last went and it was the same again this time. We just walked to the closest beach that wasn’t anything special but was huge so the kids could play football. Most of the ship has done the same thing so all the kids played together which was lovely. The 6th day was Tenerife and it was much warmer here. Again we did our own thing just getting a taxi to a beach and then we found we could get the bus back which was €5 for us all. The last day was Gran Canaria again ready for flying home. We weren’t flying until 8pm so we were able to use the ship all day. We went off in the morning and walked to a beach and went of a horse and carriage ride of the town. Not the prettiest town but the kids thought it was fun on the horse. Then the afternoon like all the other days we chilled by the pool in the sunshine whilst the kids were in the club. We are lucky our kids love a club else it would have been hard to entertain them ourselves on the ship. Ours were counting down the hours til it was on, demanding we get back to the ship! There were a few other activities for them like golf putting and skittles plus there is a card room with lots of board games but we never went in here. People have always said to me “they are such big ships you won’t feel the wave” That was not true at all. The first night I could barely stand up! People looked so drunk which was hilarious watching the 90 year olds! We were lucky that none of us were sea sick as it was choppy as you would expect it to be in the Atlantic in February. Maybe the larger ships around the Caribbean are more gentle but this definitely wasn’t. And apparently it was very calm compared to previous weeks. Would I go on a cruise again? Definitely! We all had a fab time and it was probably the most I have switched off from home on a holiday. You don’t have phone signal when you are at sea (unless you pay for the ridiculously expensive WiFi) which means more family time. I think we only got away with this ship because it was our first time and our kids were young, I reckon we could do another 1 or 2 on it but in a few years the kids would need more entertainment.